With Totalview you get a multifunctional software suite covering your entire business cycle. 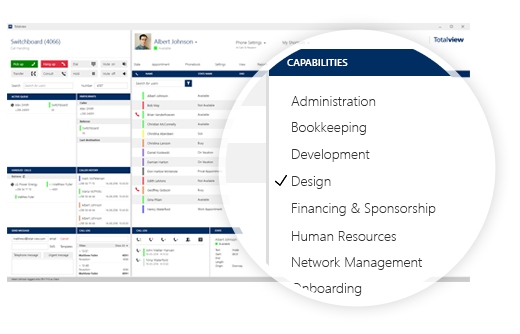 At its core, it consists of four parts: Totalview Availability, Totalview Telephony, Totalview Time and Totalview Human Resources. Totalview is a software suite with 4 tools. All designed to optimize your business, and ultimately strengthen competiviness. With Availability employees will at any given time see where their colleagues are, when they will be available and how they can be reached. 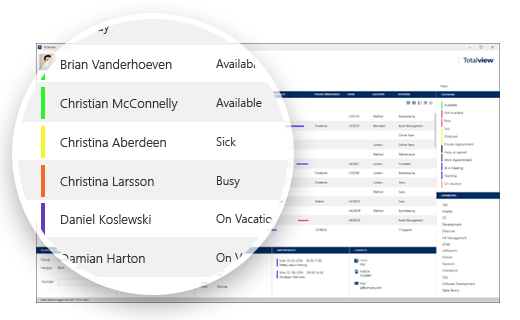 With Totalview Availability you don’t need to spend time finding employees and colleagues. See where employees and colleagues are, when they will be available and how they can be reached. See which availability states Totalview can show below. In addition to the PC client, staff members can use Totalview on the go with their iPhone, Android or Windows Phone. This means that they are no longer bound to specific places or locations to use the solution. See each others availability status. 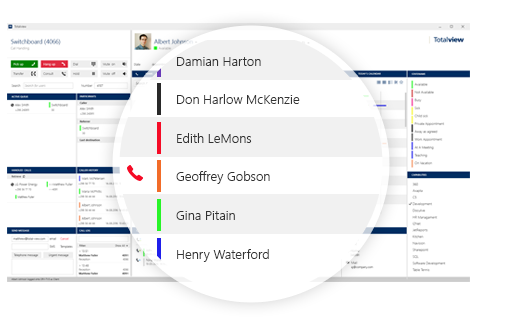 With Totalview Availability you can see your employees’ stated availability, their upcoming appointments and whether or not they are available on the phone, chat or video. This minimizes the risk of unnecessary interruption which results in more work being done. With Totalview Availability you have all information regarding availability of employees, skills, division and contact information gathered in one place. Having all this information in one place means you spend less time finding the right employee. With Totalview Availability your employees are only 1 click away. You can contact them by their local phone, mobile phone, chat, video or send text messages. 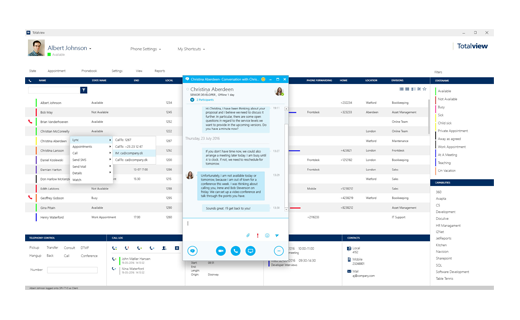 Totalview supports popular communication solutions such as Microsoft Outlook, Lotus Notes and Microsoft Lync and most PBX solutions such as HiPath, Broadworks and 3CX. 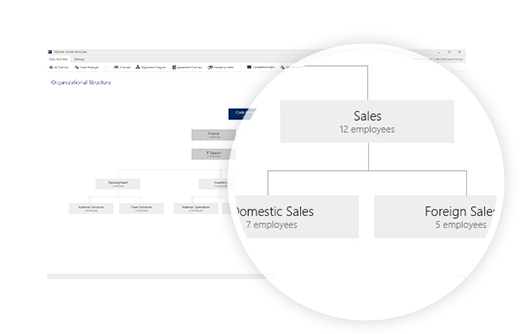 Totalview displays the information you need in a graphical overview with easy search and filter options to find available employees or skills. You can search and filter by name, division, skill, location and other preferred filters. 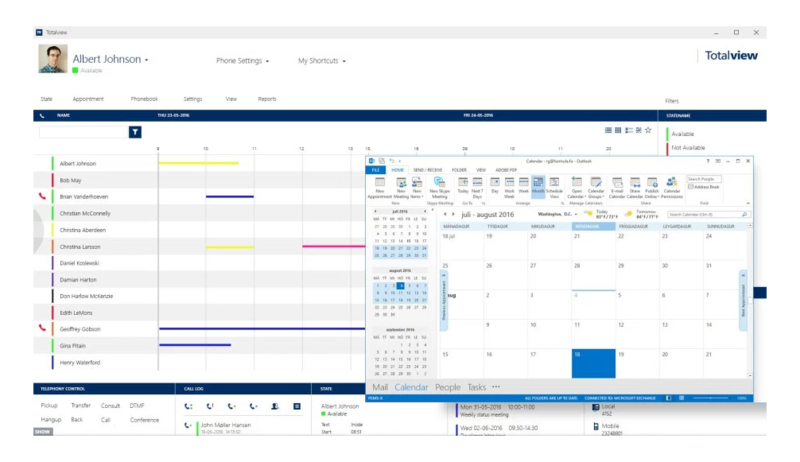 The built in calendar gives each user a full overview over employees’ upcoming calendar appointments. The calendar works both ways with Microsoft Outlooks’ calendar and Lotus Notes’ calendar. 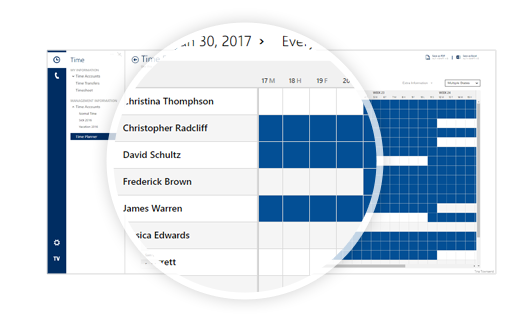 Appointments in Microsoft Outlook and Lotus Notes will automatically be reflected in Totalview’s calendar – and vice versa. Contact us today to get a personalized demo of these amazing features. Totalview Telephony enables your company to provide an outstanding calling service for customers. 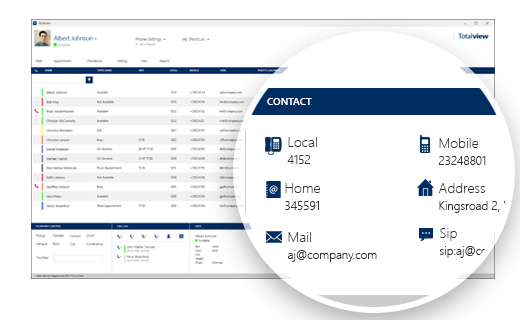 It offers a multifunctional switchboard for the frontdesk, advanced telephone features such as forwarding and conference calls for employees, and call statistics for management – all in one place. Totalview Telephony & Switchboard works with most PBX systems such as 3CX, Broadworks and Unify Hi-Path / OSO. That way you can integrate your existing technology with a powerful telephony management application to create a strong infrastructure for your business. Your company’s reception sees relevant information about the calling customer already before the call is answered. The receptionist sees who is calling and which employees the calling customer last spoke to. All to provide a better experience to calling customers. Your reception sees whether or not the employee the calling customer last spoke to is available and when he or she will be back. 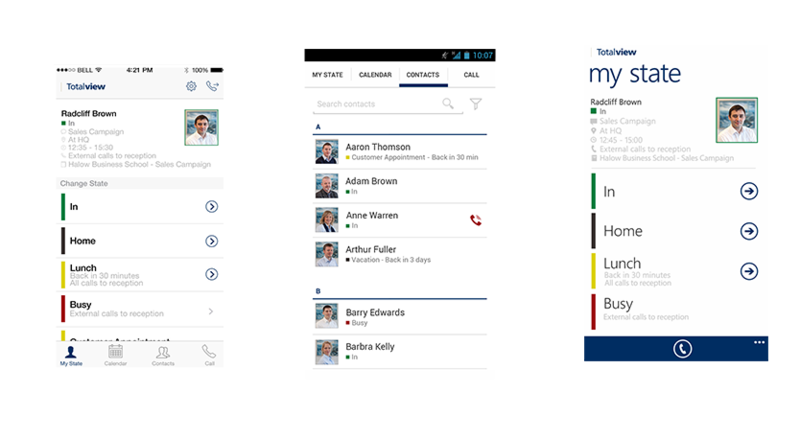 Your reception can see all colleagues and their stated availability, their upcoming appointments and whether or not they are available on the phone. This information assists your reception in making correct call transfers. This to reduce customer wait time. With Totalview Telephony & Switchboard your company’s reception has all information regarding employees’ availability, skills and contact information gathered in one place. This means that calling customers always will be transferred to colleagues with the right skill and knowledge. Totalview Telephony & Switchboard reports on how long customers have to wait until their calls are answered. 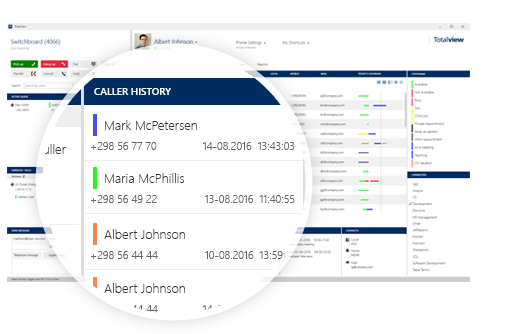 Reports also identify call load peaks and show how well your reception and divisions are handling customer calls. With these facts the reports will assist your company in providing a better customer service. We provided a demo link to our software so you can test it out. 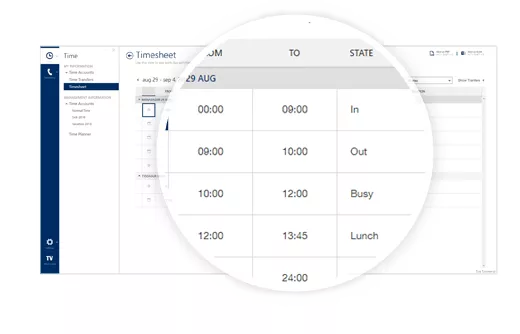 With Totalview Time you get a full-fledged time management solution for your employees. Your company can plan ahead and improve productivity based on facts about what every hour in the company is spent on. 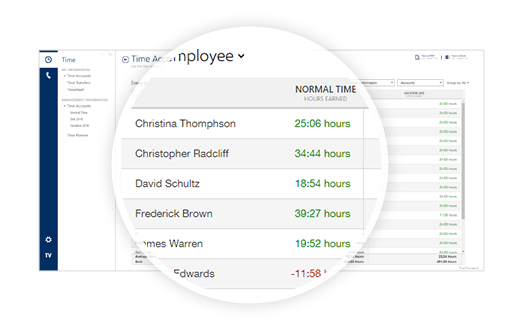 With Totalview Time your company gets an overview over staff working hours and how much time is spent on meetings, sick days and vacations. This provides information and real-time facts that will assist your company to improve productivity. With Totalview Time employees can clock in on projects and jobs. This provides information on how much time is spent on each project. With reports based on this information your company can see the difference between the time estimated and the actual time spent on a specific project or job. This will assist your company in making better estimates of projects in the future. Do you need a visual overview of your organization’s vacation patterns? 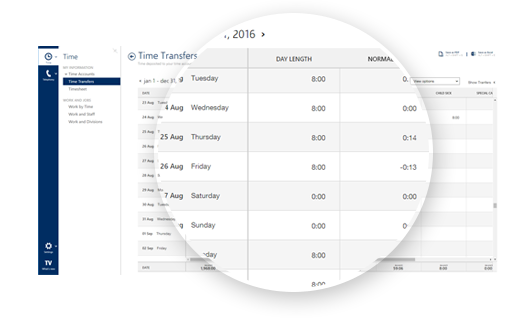 With Totalview 2016, you are able plan your activities based on your employee’s current time data, giving you the power to identify shortcomings and optimize your available resources. 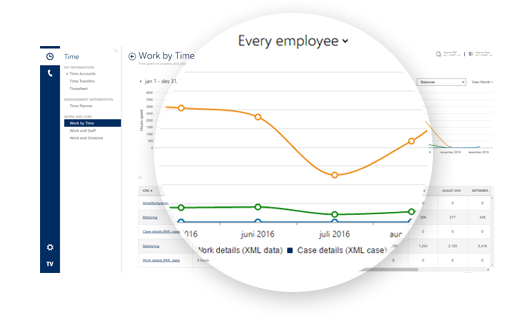 Totalview Time registers and documents staff and project activities in real-time (the actual time spent) to provide facts which your company can base its decisions on. Totalview can be customized to integrate with existing wage management applications, so you don’t have to maintain data for different systems in your organization. 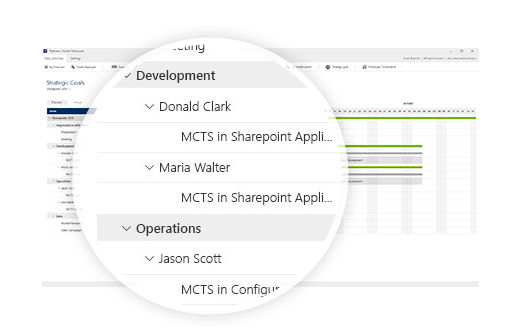 It is now possible to supervise and evaluate project work across multiple dimensions. You can analyze your hours over time, per employee and for entire divisions. Totalview HR gives your company insight and complete overview over all relevant staff affairs. With this information your company can become more organized and optimize staff procedures to make more optimal use of skills. All to give higher employee satisfaction and lower costs to improve competitiveness of your business. With Totalview HR you have quick and easy access to all relevant staff information in one place. Within a staff profile you can see the employee’s skills, education, salary agreement, time registrations, phone usage, course certifications, debtor cards, contact information, birthdays, anniversaries and handed items such as keys, uniforms, computers and mobile phones. See who is best fit for the jobs by comparing employees’ skills such as education, course certification, language skills and job experience. That way, you can maximize your work efforts and focus on your business. 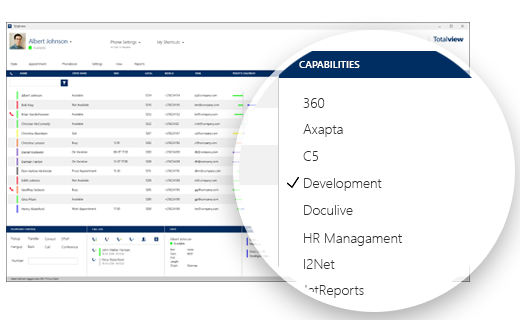 With Totalview HR your company can set up procedures and goals for workforce development and follow the progress in real-time. 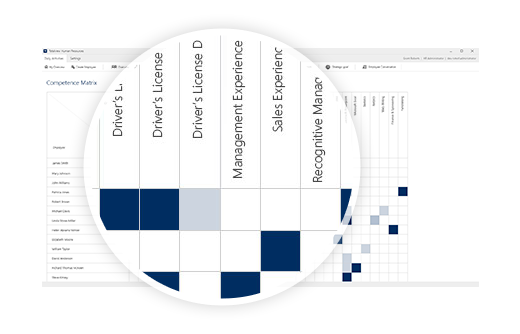 This systematic approach to competence and qualification development gives higher employee satisfaction and lower costs to improve competitiveness of your business. Totalview HR provides information about your company’s human resources in numbers and figures to identify shortcomings. 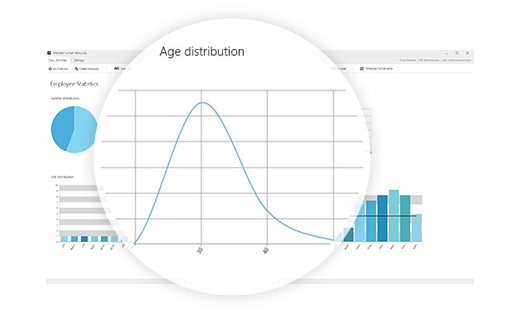 See the numbers of FTEs, management distribution, age and gender distribution. 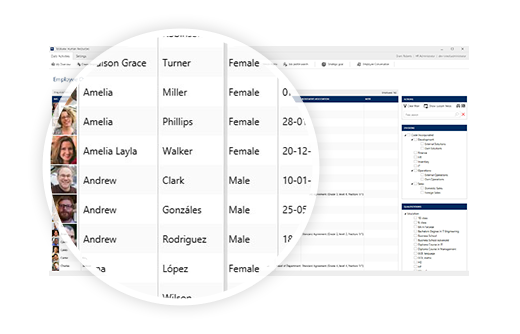 Based on information about your company’s human resources Totalview HR can visualize the departments and related employees and the relationships between them.